There is a demand for organic cotton production in North Carolina, however there are many challenges associated with that production. Weed control, insect pressure, and limited genetics all are restraints to organic cotton yield in our region. 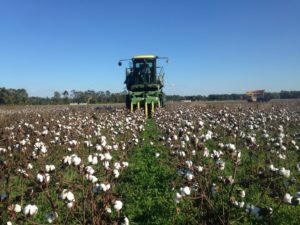 Several growers have attempted to grow organic cotton in North Carolina but they have generally been unsuccessful, largely due to weed control challenges associated with adverse weather preventing timely mechanical cultivation. A production system that allowed for early season weed control without relying on cultivation may allow growers to overcome this production challenge. Alternatives to mechanical cultivation for weed control in organic production, such as cover crop mulches (no-till/roll-kill) and flame weeding, have been used successfully for weed control in organic corn and soybeans in the state. However, these practices have not previously been investigated for weed control in organic cotton production in North Carolina. Researchers at North Carolina State University (NCSU) and the Rural Advancement Foundation International-USA (RAFI) sought to investigate alternatives to sole reliance on mechanical cultivation for weed control in organic cotton production, and to evaluate experimental varieties for use in organic cotton production. Roller-crimping a cereal rye/ crimson clover cover crop mulch in early May at the Upper Coastal Plain Research Station in Rocky Mount, NC. Studies were conducted from 2014-2016 evaluating cereal rye and crimson clover cover crop mulches as weed control in cotton, with no synthetic herbicides used in conjunction. 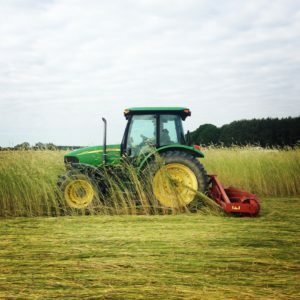 Cereal rye was used because it is the highest biomass producing winter cover crop in the region, and biomass production is directly related to weed control in the subsequent crop. Crimson clover was mixed with the cereal rye because early season N release from a legume cover crop can be important for fertility management in organic systems. Cereal rye was seeded at 110 lbs/acre and crimson clover at 10 lbs/acre in mid-October using a grain drill. The cover crop mulch was terminated using a roller-crimper at cereal rye soft dough stage in mid-May, and cotton was planted directly into the rolled cover crop mulch. Cover crop biomass production at our experimental sites can be found in Table 1. Previous work in the state demonstrates that >8,000 lbs cover crop biomass/acre is typically necessary to provide season-long weed control in the absence of other weed control methods. Cover crop biomass levels at all of our experimental sites in this study were well below that threshold, and this resulted in poor weed control from the cover crop mulch at most of these sites. Lack of sufficient weed control from the cover crop mulch prevented mechanical cotton harvest at three of our five experimental sites. A few factors likely contributed to low cover crop biomass and weedy conditions in these studies. First, these studies were conducted on conventional sites with sandy soil types typical of cotton production in the state. Soil residual nitrogen was likely lower on these sites than would be encountered on organic sites with a long-term history of manure and legume use, and therefore there was less fertility available to grow the biomass needed for a successful roll-killed cover crop mulch. It is possible that an organic grower on the same soil type would have more residual nitrogen from previous fertility management and may see greater cover crop biomass production compared to what was observed in this study. Other factors that influence cover crop biomass production include early cover crop establishment and adequate cover crop fertility. Additionally, these studies were conducted on sites used for weed science research at NCSU and therefore had extremely high weed pressure that may be unrealistic of normal field conditions, though it should be noted that some organic farms also have strong weed pressure. Organic cotton harvested in November 2016 at the Peanut Belt Research Station in Lewiston, NC. Note the regrowth of crimson clover in the under-story. One benefit observed from the cover crop mulch in this study was that the presence of the cover crop mulch always enhanced soil moisture availability compared to no cover crop. This can be an important benefit of cover crop mulches. Previous work from Georgia also shows that a cereal rye cover crop mulch reduced thrips pressure in cotton production (Collins, personal communication). Thrips pressure in this study was low enough that this benefit was not observed, but it could prove an important insect management tool for organic cotton producers. In 2015 RAFI began testing experimental cotton varieties that can compete well in cool, wet spring planting conditions often encountered in North Carolina. The experimental varieties were planted in 2015 and 2016 on four different planting dates starting in mid-May through early June. So far, yield results show that planting near the end of May, produced the highest yields in our trials. This year (2017) we have planted the six highest yielding experimental varieties at the Upper Coastal Plain Research Station and on an organic farm in eastern North Carolina. RAFI is also experimenting with different weed management strategies for organic cotton production. In 2015, cross cultivation was tested. This is where the field is cultivated in two directions, the first pass parallel to the row and the second pass at an angle that destroys some of the plants in the row. While this did reduce weed density, there was still a significant amount of weed pressure and reduced yield due to the cotton plants lost during this process. The overall yield was 435 lbs/acre, but the plots were managed conventionally other than for weed control. In 2016, with input from an organic farmer that has grown organic cotton in the past, we cultivated with a Danish tine once it emerged and then used a rolling cultivator for the next eight weeks. This test plot averaged 568 lbs/acre. Both the NCSU Organic Grain program and RAFI are dedicated to continue organic cotton research in North Carolina. If reliable production practices can be identified, this could prove a profitable organic crop for producers in the state. Future research focus areas include continued investigation of cover crop mulches for weed control and soil moisture conservation under varying fertility regimes, flame cultivation for weed control, insect control, and varietal investigation. A special thank you to the North Carolina Cotton Producers Association for funding this cotton production in rolled cover crop mulch research. For more information on this study please contact Rachel Vann at raatwell@ncsu.edu. • Rye and Ryegrass - What's the Difference?